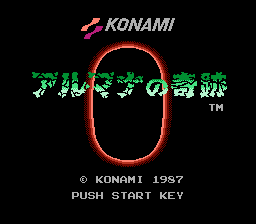 An overlooked Konami game for the Famicom Disk System. In Almana no Kiseki (The Miracle of Almana), the magic jewel Almana has been stolen and the village, that used to guard it has been turned to stone. The player must venture into caves, forests and temples, face many challenges, retrieve the stolen jewel and return it to the village. 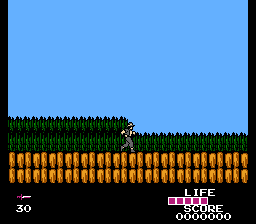 This is a rather unique side-scroller, where the player has access to a variety of weapons and a grappling hook, with which they can climb hard to reach areas. The player will have to use the grappling hook often, so mastering its use is necessary. 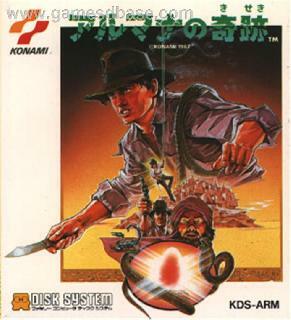 The game is heavily inspired by "Indiana Jones and the Temple of Doom", features top-notch graphics and an amazing soundtrack by Kinuyo Yamashita, who's best known for the music in "Castlevania". Now you can add videos, screenshots, or other images (cover scans, disc scans, etc.) for Armana no Kiseki (Japan) to Emuparadise. Do it now! If you haven't noticed yet, we have a retro game of the day feature (top-right of the screen) wherein we feature a new retro title every single day! Now, you can vote for your favorite games and allow them to have their moment of glory. Click on the button below to nominate Armana no Kiseki (Japan) for Retro Game of the Day.